In the midst of the ordinary and the mundane and the pain – it can be hard to see the hand of God. Sometimes the fear of the unknown, the loss of a loved one, or the basic daily hardships of life –can wear us down. What I love about the book of Ruth is that we see two very broken women – both widows and both unsure of what the future holds…move forward in faith. And its in the midst of the mundane and the pain that God begins to unfold a beautiful story that goes from ordinary to extraordinary! The invisible hand of God was at work in Ruth’s life and the invisible hand of God is at work in your life too! Come join me on this video as we discuss God’s work in our lives. Naomi’s name means “pleasant” but after all of her loss and sorrow she told the ladies in her hometown to call her “Mara” which means bitter. 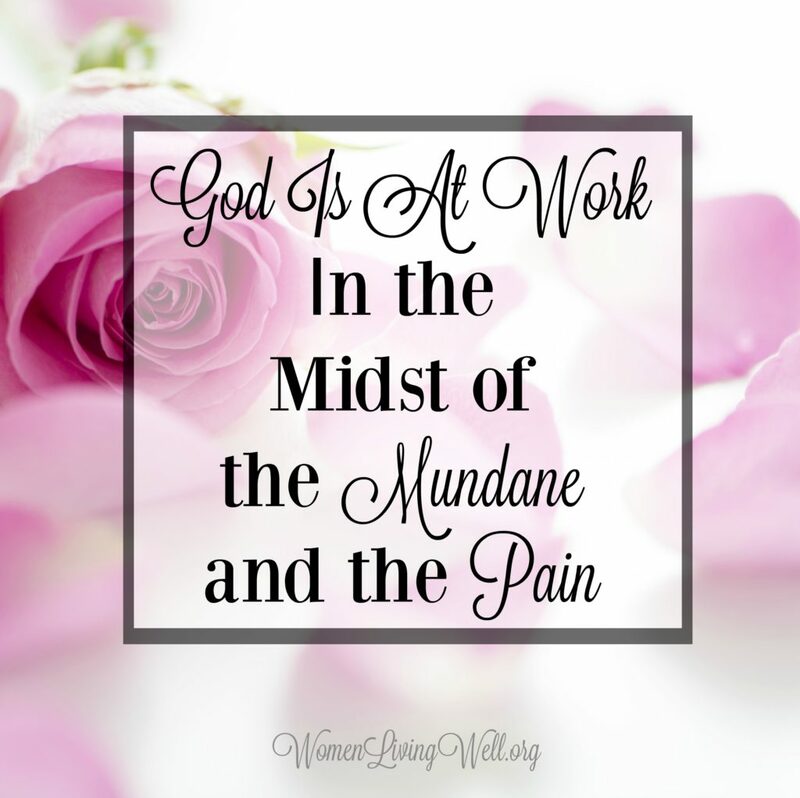 Sometimes it can feel like God is not at work in our lives or that he is even working against us! All we see is the bitterness. Bitterness can cloud our vision and cause us to lose hope. If you are in that place today I want to encourage you. First, God loves you so much. Second, wait on the Lord. More time may need to pass before you can see what God is doing. So keep trusting in the Lord. Third, bitterness is self-destructive and will eat you up inside. You do not want to hold onto it. Today is the day to let it go! 1. Talk to God about your bitterness. Get alone in prayer, and confess your bitterness to God. Put a Biblical filter on your thoughts. If it is not, I must do what 2 Corinthians 10:5 says: “Take every thought captive to obey Christ.” I must make my thoughts obedient to Christ. 3. Replace bitterness with thankfulness. We must not let those thoughts swirl in our heads. Eventually everyone can see it in our demeanor, our lack of joy, and even in our words. It can’t be hidden. Let’s replace those thoughts with thankful thoughts full of grace. If you are looking to overcome bitterness realize that this is not something that will happen overnight. It’s a lifelong journey of guarding your mind. The enemy would love to get a foothold in your life by using bitterness, so beware! Put Philippians 4:8 as a filter over your mind. So many times I have tried to figure out what God is doing. But the one thing I have learned is…I don’t know what he is doing! And I just have to trust and wait and see how it all unfolds in my life. If you are in this place today, I pray that you will walk obediently with the Lord as Ruth did. Ruth moved forward in her brokenness and continued to be kind, pure, loyal, bold and diligent. God blessed her faithfulness. As we continue in our study of the book of Ruth, I pray it gives you great comfort and hope! What has God been teaching you this week in your study of the book of Ruth? In the story of Ruth I can see into the heart of Naomi; she experienced the hardships and great losses of life,and responded to it with bitterness! What stands out to me in your comments is in the 3rd point you made about “eventually everyone can see it in our demeanor”. Even in our losses and times of pain , God still wants us to trust in Him, continue to live holding on to Him so others can see God displayed in us at all times! Bitterness can go very deep is ugly inside and outside, but our demeanor is to display a continued thankfulness to God! I know I am bitter and it’s impacting my health. Bitterness from daughter’s job being “eliminated “. Y’all it was over a year ago and I cannot get past it. I won’t continue with this but I am begging for your prayers. I’ve read today’s devotion and everything in it will help me and I’ll try to apply all the biblical teachings and advise. I’m so miserable and need help. Also a little embarrassed to admit all this. Thanks for kindnesses. The Bible says to confess our faults to one another. Thank you for asking for prayer for this. This is something you obviously are seeking the Lord’s help with. I prayed for you this morning. God bless. Nan I know this is so hard for you! When I read it, I just ask God to help you let this bitterness go in Jesus name! Holding on to it will just make you sick and depressed, and that is not of God! It is Satan trying to convince you to hold on to it! He is a liar, and God is setting you free! God bless you dear one! Sometimes it’s so hard to get past something like that, even when it’s been what we might consider a lengthy period of time. Confessing that bitterness is the first step toward getting out from under it. I’m praying for you today that God will guide you to a place of peace. Hi Nan!! Your on the right path to letting it go. Admitting you have bitterness and that you know it is damaging your health and the person you are. When I’m struggling with conflict, I ask myself, does feeling this way really help the situation or conflict, does my worrying and hashing it over and over really help at all? Of course it doesn’t, then the next step is to give it up, surrender it to the Lord. The Lord knows what to do with it better than we do. Then get ready to see a new you!! I have been in your shoes. My husband was a very loyal employee who worked hard at a company for 5 years before his manager let him go with no cause. The manager was never kind to my husband and even took credit for my husband’s good work, but my husband always gave him respect. My feelings were hard to deal with, because I just felt angry. I prayed for God to help me with my feelings, but really it was in my hands as what attitude I would take. So In the presence of dear friends and my husband, I prayed a blessing over my husband’s manager. Did he deserve my blessing? No! but I didn’t deserve forgiveness from the LORD, but he gave it anyway and willingly. It wasn’t enough to just say, “I forgive”, because the unforgiving feelings would just creep back in. I had to be more pro- active and deliberate in loving this man and seeing him through the eyes of the father. So I blessed him! I prayed for him to have prosperity, to have favor with his superiors, to be blessed by good relationships, to enjoy the fruits of his labor, and for God to protect him from harm and protect his reputation. That many would seek him out as a mentor and that he would enjoy giving of himself in a positive way, etc… Immediately, after praying, I felt at peace and no feelings of anger or resentment ever came back. I truly gave it into God’s hands to deal with him the way the Lord truly wants to offer himself to all people; with LOVE and forgiveness and many blessings. This was a huge weight off of me to have my bitterness removed and my joy restored. You’ve got this, Nan! I wish you well. Christina ~ I love your reply to Nan. Thank you for this post. It was very encouraging. Amazing encouragement through this study AND this video! Thank you so much!!! I’ve learned that no matter what situation or circumstance God is always there leading me through it with Jesus by my side with encouragement. Thank you for this post I’ve been dealing with some bitterness that I need to kick that bucket away. So this was encouraging and healing thank you Courtney! I need to take more of an active control over thoughts of bitterness and of jealousy. That I need to remind myself, just like Ruth & Naomi — we don’t know what is God’s plan just waiting behind the corner. These two broken women had no idea how their lives would move into a different phase after suffering just devastation. They had no way of knowing but they had faith! So should I! I have already been blessed by this study because I find myself so much like Naomi. My husband and I lost our sweet baby girl, Ella Faith, after only one hour and we are not able to have more children. My husband does not want to adopt. So I have absolutely found myself angry at Got and holding on tight to that root of bitterness. I pray daily and to have that stronghold removed from my life so that I can experience the joy of the Lord again!! This study is just what I need! Thank you again for bringing these studies into our homes!! I cannot imagine the pain and anguish you and your husband are in, so all I can do is pray hard for the both of you that you will know God’s peace and His comfort and His grace. We may never understand this side of Heaven why things happen as they do, but I am praying for you both and will continue to do so. God’s been teaching me this week that there are two basic perspectives we can have regarding the difficult circumstances we find ourselves in. We can be like Naomi, and be angry and bitter and resent those around us that don’t seem to be struggling or suffering as we are. Or we can be like Ruth, trusting God even when we don’t understand what’s happening or why things have been allowed to happen like they have. It’s easy to trust Him when everything’s going well; much harder to trust Him when He seems to have let go of the wheel and we’re spinning out of control. But if we’re honest, if things are going well for us we’re not having to trust that much. So the real act of trust comes when we want things to be one way and God decides it will go another. My mother passed away three weeks ago today, and I have been struggling with this perspective issue and trusting without understanding the “why”. It’s hard. But every day I keep getting up, praying for His help and guidance, and doing my best to focus on His goodness and His sovereignty and His love. I know that He is with me in my grieving, and so I just keep plodding forward. Courtney, thank you for this study. I just discovered this site and I’m so glad I did. It’s exactly what I needed. This is so encouraging! It is so amazing wisdom in the Word that says “to be thankful in every situation”. That thankful heart won’t get bitter easily! So if we would just remember that and – even when it feels like not have any reason to be thankful – we would still thank God of everything He has done for us, and all of His promises. Trying to remind myself about this today too. Thank for another indepth study, Courtney. I know they must be a lot of work to put together and i marvel at and am grateful for your and your mother’s knowledge of the bible. I am learning a lot already and, of course, have a low simmering bitterness that i want to wash away for good. May God continue to bless you and your family. Many thanks to you. God has given me strength to carry on. I know he has a plan for me and that I can place my burdens in his hands. Psalms 55:22 ” Cast your burden on the Lord, And he shall sustain you; He shall never permit the righteous to be moved. I seriously don’t feel like I have the patience and it’s a daily struggle…..
I’m glad we have him but on the other hand is very tiresome…. Love the book of Ruth …. Yes, praise and thankfulness always seems to help. Also remembering what God has done in the past. I’m glad we are studying Ruth and digging deeper into her story. I have been dealing with sadness, jealousy and bitterness on and off over the past year. I need to let go of all that and also wait on the Lord. He has a plan. I need to keep trusting Him. I love these steps for taking ahold of bitterness. I so appreciate how you make every study and blog so practical – not just sharing God’s word but how we can actively apply it. Thank you! I am a week behind on looking over the resources, but maybe that was the plan all along. I needed to hear this about bitterness. Though I havr talked with God about it quite frequently, I have not been filtering my thoughts or replacing the bitterness with thankfulness. Thanks for the words of encouragement when I needed them the most! So grateful of the timing and discussions provided. It aleays seems to be what I need to hear at the right time. I WAS ON BUSINESS TRIPS AND VACATION THE WEEKS THIS STUDY WAS GOING ON. I HAVE THE BOOK AND WAS WONDERING IF THERE ARE ACHIVES WHERE I CAN START THE STUDY NOW?